Ḥakam Bashi (chief rabbi) of Jerusalem; born at Safed, June 1, 1817. He was taken to Jerusalem in 1823. His teacher was R. Benjamin Mordecai Nabon, who, in 1828, married his widowed mother. 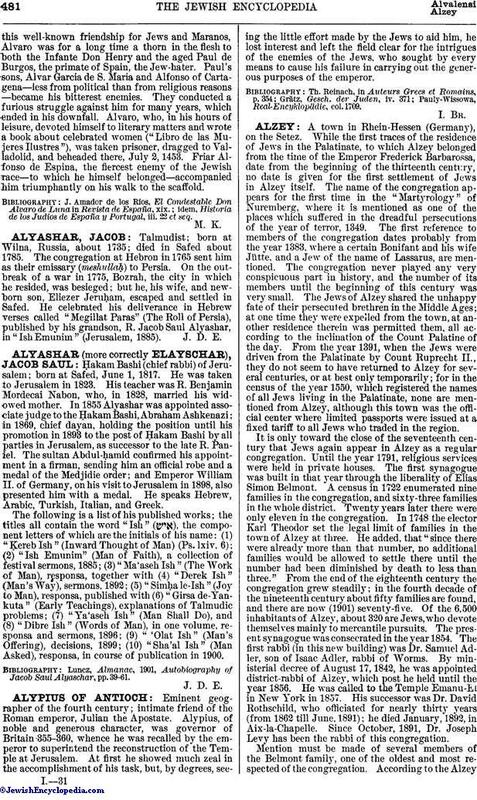 In 1855 Alvashar was appointed associate judge to the Ḥakam Bashi, Abraham Ashkenazi; in 1869, chief dayan, holding the position until his promotion in 1893 to the post of Ḥakam Bashi by all parties in Jerusalem, as successor to the late R. Paniel. The sultan Abdul-Ḧamid confirmed his appointment in a firman, sending him an official robe and a medal of the Medjidie order; and Emperor William II. of Germany, on his visit to Jerusalem in 1898, also presented him with a medal. He speaks Hebrew, Arabic, Turkish, Italian, and Greek. The following is a list of his published works; the titles all contain the word "Ish" ( ), the component letters of which are the initials of his name: (1) "Ḳereb Ish" (Inward Thought of Man) (Ps. lxiv. 6); (2) "Ish Emunim" (Man of Faith), a collection of festival sermons, 1885; (3) "Ma'aseh Ish" (The Work of Man), responsa, together with (4) "Derek Ish" (Man's Way), sermons, 1892; (5) "SimḦa le-Ish" (Joy to Man), responsa, published with (6) "Girsa de-Yankuta" (Early Teachings), explanations of Talmudic problems; (7) "Ya'aseh Ish" (Man Shall Do), and (8) "Dibre Ish" (Words of Man), in one volume, responsa and sermons, 1896; (9) "'Olat Ish" (Man's Offering), decisions, 1899; (10) "Sha'al Ish" (Man Asked), responsa, in course of publication in 1900. Luncz, Almanac, 1901, Autobiography of Jacob Saul Alyaschar, pp. 39-61.